For 3 days, from 19 to 21 November 2012, all eyes of the CEA team and representatives of JAEA and F4E were riveted to the measurement devices in the small control room of the IFMIF Injector at CEA/Saclay during the acceptance tests of the injector. 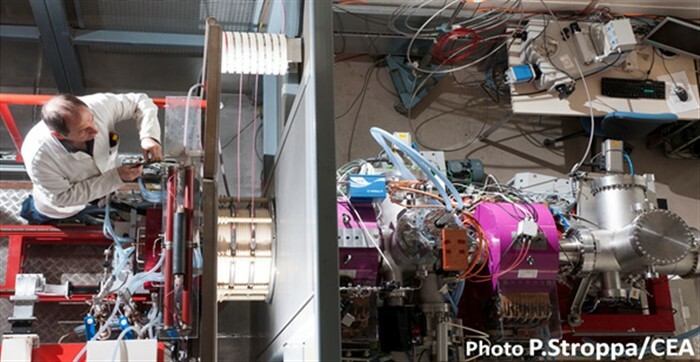 This is the first component of the Linear IFMIF Prototype Accelerator (LIPAc) presently under construction, under the framework of the Broader Approach Agreement, aiming to demonstrate the feasibility and to develop the technology for IFMIF. The injector has to deliver a high intensity and low emittance deuteron beam (140 mA, 100 keV) with high reliability. The ion source is based on an electron cyclotron resonance (ECR) cavity, excited by a 2.45 GHz magnetron. The extracted beam must be properly matched to the entrance of the downstream component (Radio Frequency Quadrupole) by means of a dual solenoid focussing scheme in the Low Energy Beam Transport (LEBT) line. In order to meet the beam emittance and matching requirements, the strong space charge must be very well compensated by a dense electron cloud produced by interaction of the deuteron beam with the residual gas all along the HEBT line. An experimental programme had been carefully established to increase gradually the performance of the high intensity LIPAc Injector. On the first day, a proton beam was produced at low duty cycle by injection of hydrogen gas in the plasma chamber of the ECR source. On the two following days, by switching from hydrogen to deuterium, the deuteron beam was produced and the duty cycle was smoothly ramped up from 10% to 100% (continuous beam). Meanwhile, all parameters were adjusted (magnetic configuration in the plasma chamber, gas flow rate, voltage of the extraction electrodes, HEBT solenoid field, etc) in order to optimise the current and the beam emittance at the exit of the beam line. A current of 140 mA with an energy of 100 keV was achieved (resulting in a total current of more than 170 mA due to the additional molecular species D2 and D3). The emittance was within the range of the specification (0.2 to 0.3 pi mm.mrad) but could not be measured at full duty cycle as the present emittance scanner could not sustain such a high beam power (14 kW). After this successful test campaign, the Injector has proven its ability to produce a high intensity continuous deuteron beam (world record) with high quality, and is ready to be dis-assembled, packed and shipped to Rokkasho in Japan with an expected arrival at the end of March 2013. It will be the first accelerator component of the Linear IFMIF Prototype Accelerator to be installed and commissioned in the accelerator building of the Rokkasho Broader Approach site.